Big performance doesn’t have to come with big dimensions. Fuji Xerox makes you rethink size with the DocuPrint CM415 AP / M465 AP. Compact yet fast and flexible, these two smart machines are set to bring productivity in your office to a new high! The DocuPrint CM415 AP / M465 AP are a compact print solution, delivering fast print speeds and exceptional colour and monochrome print quality, supporting copying, faxing and scanning and email. The DocuPrint CM415 AP / M465 AP offer support for mobile devices, allowing easy access to the device whether you are in or out of the office. 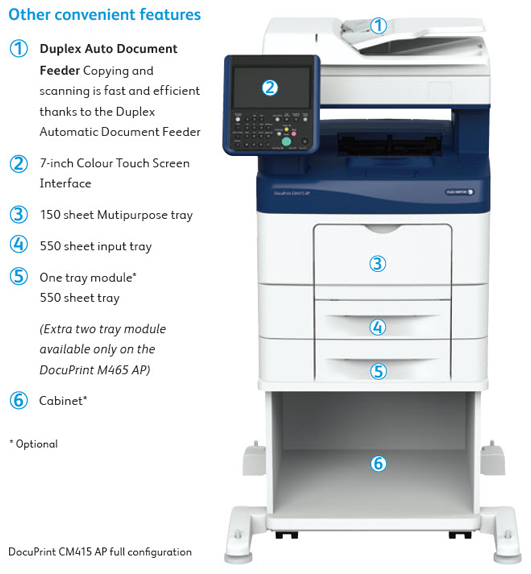 The built-in Authentication feature available on the DocuPrint CM415AP / M465 AP adds secure document printing for up to 1,000 users. Documents can be sent to the device, where they are held in its hard drive until you release the job by entering a password or pin code. For even greater efficiency, you can ‘tap-and-go’ to release the print job with a security swipe card by adding a built-in IC Card Reader^ to the device. IC Card authentication can also provide access control to specific functions on the device, enhancing both security management and user convenience. This is critical in environments where multiple users have access to the same device, and where confidential documents could fall into the wrong hands. The DocuPrint CM415 AP / M465 AP feature advanced reporting that can track and report every page that is printed on the device – by user, workgroup or department. By adding the optional Image Log Kit, you’ll be able to automatically store every image that’s ever been printed, scanned, copied or faxed to a third party server or folder. It’s the ultimate safeguard if you require an audit trail for legal or security reasons. Print limits can be assigned per user or group, including copies and scans. This not only gives you complete control over your print costs, but also gives you total visibility of your print environment. DocuWorks is a document handling software that integrates with the DocuPrint CM415 AP / M465 AP. It allows you to manage and share information by seamlessly handling, searching and editing electronic documents created with various applications (Microsoft Office, PDF, etc) and paper documents imported from scanners. 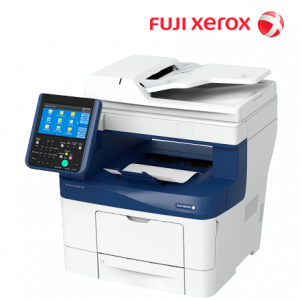 Furthermore, when integrated with Working Folder* – Fuji Xerox’s cloud service, you can securely access your information on the go through an internet enabled device. With the optional Searchable PDF Kit you can convert paper based documents into searchable PDF documents. Perfect for archiving, your documents can be stored electronically, saving on bulky storage space and time consuming document handling. And as the documents are now ‘searchable’, retrieval of information is quick and easy. The manual processing of paperwork in business is costly in terms of time and resources. The DocuPrint CM415 AP / M465 AP can automate these manual processes by customising the control panel to your specific requirement. If you regularly scan and email documents to certain people or workgroups, you can set up a specific icon on the control panel to do this automatically. 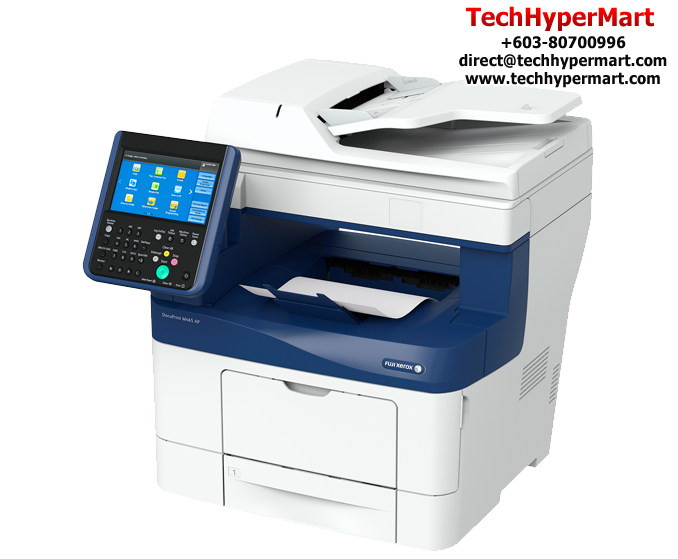 For example, if you want to scan a document and save it to a network folder, and at the same time email it to a certain address, plus make 3 copies of it, then this can be automated through a press of a single button. If you want to turn a complex document into a searchable pdf, store it in a network directory for retrieval, and compress the large file before emailing, then this too can be achieved via a one-touch operation. By eliminating manual processes many organisations, large and small, can achieve increased staff productivity, minimised risk of errors, improved office communication, and reduced overall cost of document-handling. Our EA-Eco Toner with low-melt technology achieves minimum fusing temperature at 20˚C less than conventional toner for significant energy savings. The DocuPrint CM415 AP / M465 AP conform to the International Energy Star Program standards for reducing power consumption. Devices located at a distance may be switched off remotely via PC. In large facilities such as a campus or factory building, this feature can reduce the time and labour required to manage remote devices. All-in-One First Page Output Time Approx. 5.0secs.